Rediff.com » News » Guess what? 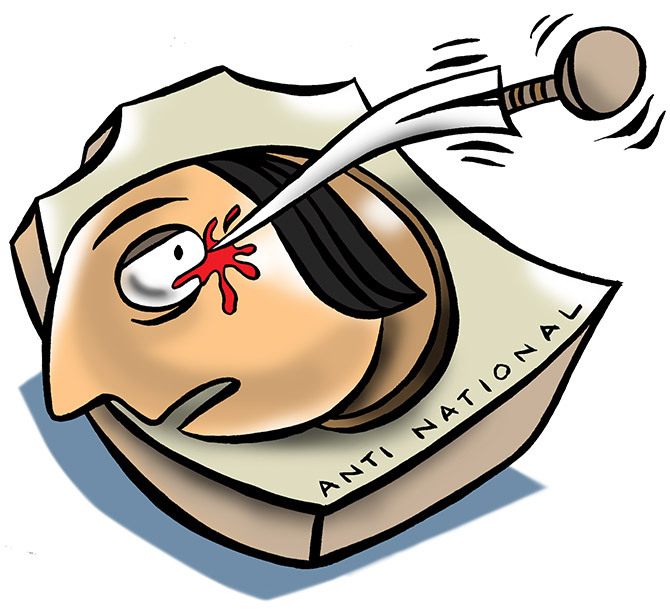 I am an anti-national! 'If ever I served my country, it was by earning the label 'anti-national' in the age of Modi,' says Mitali Saran. Since the last award I won was in college, and since I expected to go to my grave without ever getting another, my ears became pink with pleasure when a friend showed me that I'd been featured on a kind of honour roll poster put out by some Web site. It's one of those Web sites that lives in the gutters of the Internet, and one of those posters where they steal your face off a newspaper column and paste it among other faces on a saffron and yellow background, with explicatory text about leftist rumour-mongering anti-nationals, and artworks consisting of explosives and jolly red blood spatters. One does not like to be boastful, but one did allow oneself a brief moment of emotion. Recognition at last! -- and sweeter still for being shared with a number of other faces that I know and respect. I immediately began composing an imaginary acceptance speech in my head, and got as far as "This award really belongs to us all..." before choking with imaginary stage fright. I shared my modest accomplishment with my family. My mother, who is impossible to please, did not even try to look happy. My sister said she felt sick. 'Honour', 'hit list' -- you say potato, I say potahto. My brother didn't answer his phone, which is so normal that I think he may have secretly listed the whole family under 'Don't Pick Up'. Anyway none of them was happy for me, which I plan to keep in mind when I write my will. Luckily there are friends and colleagues and perfect strangers on social media to step in when your family lets you down, and several people congratulated me warmly. Of course, awards inevitably come with a comet tail of envy and recrimination. Why wasn't I on this list? people asked angrily. Why you, or her, or him? You must have pulled strings. Where do I apply to get on this list? I'm just as anti-national as these people, why are they ignoring me? And on and on. Some of them even rang up other people to needle them about not being featured despite being fully deserving of a spot. People can be so petty. But at least it was because they, unlike Some People who may no longer be my nominees, could see that making it into such a publication means something good. I am hardly blind to the nasty intent of this poster, and of all the other similar lists that are routinely compiled and shared on Facebook and on Whatsapp, of people who have criticised the right wing or the BJP government, or signed inconvenient petitions. Circulating these lists is mostly meant to intimidate, and if something bad happens, well, what's a list compiler to do? But there is nothing funny about homicide, so it's a good thing that at least one co-awardee has taken this poster to the police. And it's equally a good thing that despite knowing all of this, so many other people are clamouring to be on it too. For my part, I am going to print out a screenshot, and frame it, and hang the whole tiny thing on my wall. Let me say it again: It feels good to be an anti-national pin-up, even if the pins are meant to poke one's eyes out. Because if ever I served my country, it was by earning the label 'anti-national' in the age of Modi. I'm trying not to begrudge my family for throwing cold water on my warm glow. But they should know that one can only try -- I don't promise anything witnessed and notarised.